The first two weeks of the year have flown by and as I approach my 52nd birthday, I would like to make this year (and all future years too) another memorable year. My aims that I have started this year are to make sure I do achieve this. 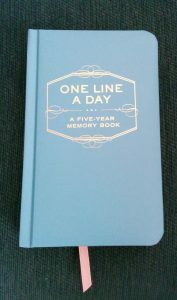 I’m also on a mission to make my Me You diary an exciting read; one that Dawn French would be proud of. I’m not going to be jumping out of planes or do any bungee jumping but I would like to make sure that each day counts. I do have a few exciting things to look forward to. I will be going to London to see The Lion King in April. Kathryn wanted to see this so we bought 2 tickets for Christmas presents. Lucky old me gets to go with her on this outing. We are also going to go to The Ritz for tea in May. 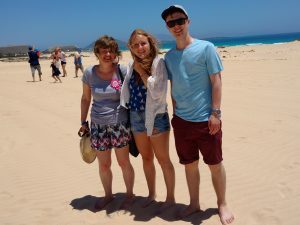 This had been one of Kathryn’s challenges set for my 50th birthday but when she did set it, she hadn’t realised that poor students could not afford this luxury, so, with reluctance, we changed the challenge. 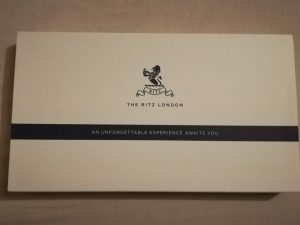 Imagine my surprise when I unwrapped a box from Kathryn at Christmas time to find a voucher for tea at The Ritz. They are certainly two experiences that I am looking forward to sharing with you. I actually finished all of the cross stitch on Sunday. 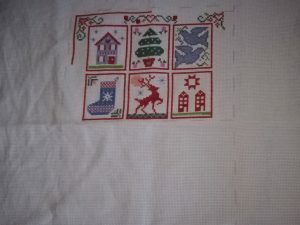 Just have backstitch, some French knots and beading to do so it will be a very good tick. 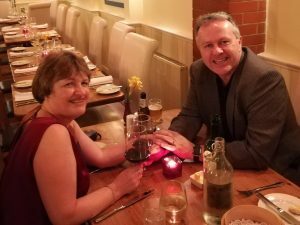 Aquafit – this was another challenge for my 50th Birthday. Amazing that I love this class now. Fat Blaster – my stomach ached a lot when I did this last week but I had done a Legs, Bums and Tums class the night before. Zumba – as I have other plans for Friday, I have to do this class straight after fat blaster. I love this zumba class. Body Jam – this is a mad dance class. Absolutely no idea what I’m doing but it is fun and worth getting up for on a Sunday morning.. I do recommend trying classes and finding what you actually like to do. So far, there has only been one class that I haven’t been keen on and that was totally to do with me; not the class itself. There are still a few more I plan to try so I think I will be making my membership pay. My old faithful kindle with hundreds of books still to read was replaced at Christmas by a Kindle paperwhite. I can now read in the middle of the night if I can’t sleep in my bed!! Haven’t had to yet though. I am always downloading books and thought that I would make sure that I downloaded new books this year from my favourite authors. I intended to make a list of 12 authors but came up with 14! My author this month was Jodi Picoult. I read Small Great Things, a book about what happens when a new born baby suddenly dies. 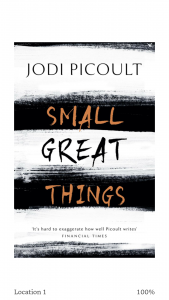 I have always loved reading books by Jodi Picoult; I love her style of writing and learning about the subjects she writes about. I have to admit that I felt uncomfortable reading this book at the beginning. It involves racism in a very violent way. There are a lot of other prejudices in the book apart from the racism and it made me think about my own prejudices; I couldn’t find any sympathy with the character who was racist at all. I actually don’t think that the author wanted us to anyway but it did make me realise how easily it can to be judgmental. I have read other readers’ reviews on this book and there are some who believe the author is not qualified to write on some of the subjects. Whilst it can be an uncomfortable read, it is a powerful one. I look forward to her next new release. This aim might seem a little mad but I always tend to cram far too much into the time before I leave for work. This one will always be a work in progress but I am actually leaving for work on time at the moment. I just can’t be held responsible for traffic though!! Another mad one but I will explain. I have never been big on make up and always find I look like a panda when applying mascara. I had started having my eyelashes tinted but I’ve decided that it is an expense I could do without. 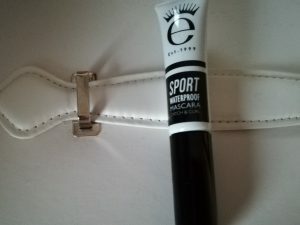 After reading reviews, I purchased an Eyeco waterproof mascara from Marks and Spencers. I decided to go for a travel size one as there wasn’t a lot of difference in the price and I wanted to check it was right for me. I have only had it a few days and have yet to check it out for a full working day or whether it lasts in the swimming pool. So this week I am hoping to start my running again, plan out the food better and maybe try to get 10,000 steps a few more times! Enjoy the third week of January – lighter evenings are coming! What is it with January and a new year. We expect it to be a new start and a new us. We plan for it to be better and we make resolutions. In reality, we still have the old concerns with us and as we continue the year, nothing has changed. Actually that isn’t really true. I believe that we can all make changes to our lives if we want them; we just have to make the commitment. It also doesn’t have to be a new start in January; it can be any month or any day you choose to make the change. Also if you fail one day, you are not a complete failure. You just put that blip behind you and continue. You will get there. I started this blog when I had been set 50 challenges by my daughter. Although I do have lots of things in my life that I’m proud of, this was a wonderful thing to do. It gave me goals to achieve. Since it finished, I have tried to find something to make myself committed and I certainly do want the years of my 50s to be memorable. I had wanted to make my goals in my birthday month so I could have another year of having a few challenges to aim for. I didn’t quite get there between June and December. I won’t say I failed; just didn’t quite start! 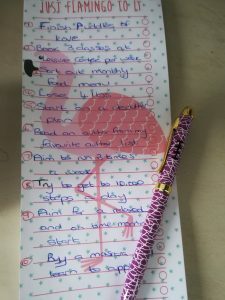 So I am actually going to start in January and with the aid of my “Just Flamingo to It” pad, I am going to start an “Aims for” list of 10 things I want to do each month. The pad is magnetic so can be put on the fridge for easy viewing. I have also put it on my keep list on the phone so I can see it everywhere. I have tried to use words such as aim and try so I won’t feel disappointed if I don’t achieve everything. I always believe that it takes a lot of small changes to make the big change in our life. 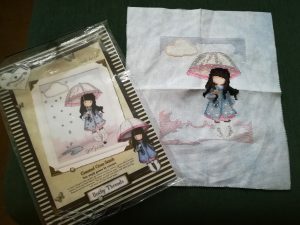 The item I want to achieve in January is to finish my Puddles of Love cross stitch so I can start on my new one. Cross stitch is something that I started in my 20s and I haven’t always been successful in achieving my finish. 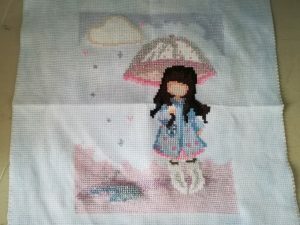 I was so proud of my completing my cross stitch challenge that I have continued with the hobby. 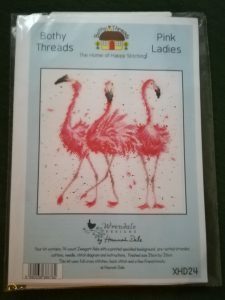 It is so tempting to open my new cross stitch but I have told myself it can’t be done until Puddles of Love is completed. To achieve this, I do have to make sure other things in my life are in order; the dinners still need cooking, I need to exercise and I need to go to work to so if I make plans to achieve these things, I have time to stitch. Losing weight is something that always seems to be a January plan. I have been lucky because in 2012, I did get to my goal weight so I haven’t had too many worries with my weight in January. This year is a bit different; too much baking! I have weighed myself today and am not going to look at the scales until January 31st. I have set myself a small goal of 4lb loss because I think it should be achievable. If I do manage (actually I will manage) to lose this and continue over the following 4 months, I will be able to get into all my summer clothes! Make today’s dinner and put some portions in freezer so it will give me more stitching time this month. In my 2nd week of the month/year, I do feel optimistic that I will be able to set and go on to achieve my aims. Have a great 2nd week of 2018! 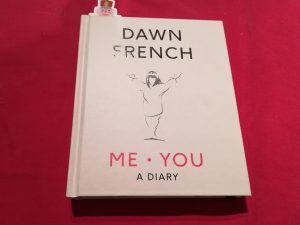 I am writing to you inspired by my Daughter Kathryn in two ways: her letters to December made me appreciate my downfalls of the month and made me want to explore the months more, and, one of the lovely gifts she gave me for Christmas; Dawn French’s Me You diary. For Christmas 2016, I was given a diary from one of my friends; One Line a Day. Whilst January is the beginning of a new year, I actually started writing in it on the 25 December; something I thought I would regret after hearing the sad news (still very sad news in my opinion) that George Michael had died. This diary is a a five year diary so each page has room for 5 years of the same day. I would love to tell you that I wrote in it every day but September I wasn’t so good. I think life seemed a bit daunting. I have recovered now and am trying to make amends to my diary! I promise to write in this every day! I needed to make a few changes in my working life so the months between September and November involved that. That led me into December, without a “proper” job due to a gamble which I do believe might have paid off. More on that later. I had decided that I wouldn’t start my “gambling” life gradually, I took a holiday; a very enjoyable one too! A bit riskier because I did have Christmas to prepare too. 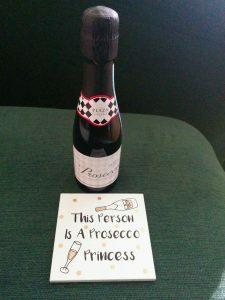 I left for my holiday with a few presents bought, no cards written but plenty ideas of what I needed to get once I got back. 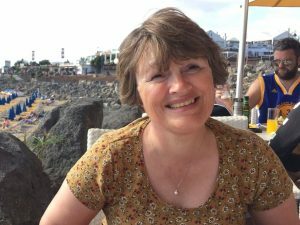 On holiday, I was able to keep up with Kathryn’s blog and her letters to December. I felt quite tearful reading some of the traditions we had created and how she had enjoyed them. Our Christmas day is always a quiet relaxed affair (even that has pressure put on it) and Kathryn did seem to appreciate them. It did come as a bit of a shock because Kathryn is far from a boring girl and our Christmas day isn’t one of these great big family days. It is always tradition for mum and dad to fall asleep. Online shopping – normally we have a Christmas shopping day which can involve going into a lot of cafes for lattes, writing out lists of what we want to buy, buying six things and then coming home to buy the rest online. One week before Christmas, the laptop was brought into action and all presents were purchased. Who needs to start shopping in September! 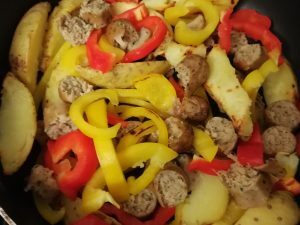 A “does it matter” approach – do I need to worry if I haven’t got swede for roast veg on the day? Is it necessary for the Christmas cake to be perfectly decorated? So what if we haven’t got shortbread (hold on I should care about that one!). What if I only decided 5 minutes before the dinner was being served I want the table to look? In the big scheme of things, these things should not put a cloud over the day. All resolvable – just have to remember to buy Marks and Spencer’s shortbread in September next year! Lists – Kathryn loves lists; they often scare me. December this year, I discovered how to use them in the best way with my phone and a program called Keep. I do love gadgets and this one certainly made me happy this December. I plan to start enjoying lists. So 2018, December will not frighten me this year. In fact, I’m not going to get frighted by any of the months. Each month, with help from Dawn, is going to be a blank page: a new month to get things right and forget about what happened the month before (I will have it all written down of course but there will be no dwelling over it). 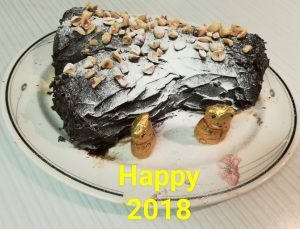 So today, 1 January 2018, I plan to eat the lovely cake I made yesterday (plan on getting back into my clothes can wait until tomorrow), hopefully achieve 10,000 steps on my fitbit, if it stops raining and make a plan for January but not the whole of you, 2018. 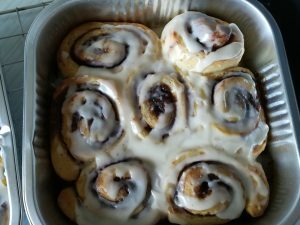 Yummy food that make my clothes shrink – to be enjoyed today! 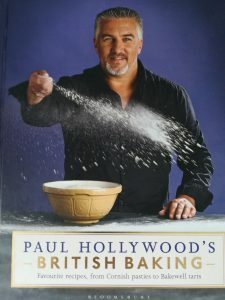 I love cooking and baking and although not trying out too many recipes from my vast book collection, my love of food is still there. I am probably still a person who is a traditionalist with her meat and vegetable meals but have made Mondays a meat free day. I have to work hard on remembering this when making my sandwich for work. Another thing I do tend to do is follow recipes very closely and rarely deviate from them. I’ve surprised myself recently by actually coming up with my own Monday night recipe. This one is quick and easy and contains just five ingredients; three of which are my favourite foods of the moment. 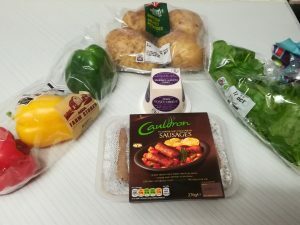 Cauldron Lincolnshire vegetarian sausages – I love sausages and wanted to find a vegetarian sausages. The reviews were very good for these and I can confirm that they are lovely. They do a few varieties and whilst normally I would go for a Cumberland, they are not as good as a Lincolnshire. Spinach – I just so love this. Why does it disintegrate so much! Goats cheese – Chris has raved about this for years but I’ve only just started enjoying it. My favourite cheese (other than cheddar) at the moment. I will still eat Camembert, Brie, Wensleydale with cranberry, etc! Baked potatoes – I forgot; I love potatoes in any form – mashed, roasted, chipped, baked and let’s not forget the plain boiled new potato. Peppers – any colour will do. I allow 2 sausages per person and whilst I could fry this, I tend to stick these in the oven for 20 minutes whilst preparing the rest. The great thing about these sausages is that you can actually cook them from frozen so I don’t have to remember to get them out of the freezer. I put the potatoes in the microwave allowing one per person. Whilst these are cooking, I slice two peppers (any colour but red and yellow give a wonderful colour to the dish). Once the potatoes are cooked, (I always over cook but it still works) I slice each one into wedges. My lovely red pan is put onto heat with a squirt of oil. I add the potatoes to this and fry until turning a golden brown. Then add the peppers and continue frying for a few more minutes. I then chop the cooked sausages up, add to the pan along with a bag of spinach and continue cooking until the spinach has wilted. It might look like a lot of spinach but it isn’t when this process has completed. Add the goats cheese and the dish is ready to be served. Once upon a time, I would have made sure Chris has the most of everything. I realise now that life is too short; I go for lots of goats cheese! New potatoes can be substituted for the baked potatoes. 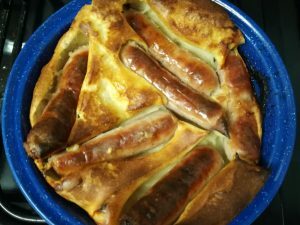 The sausages are also great in a toad in the hole (another favourite dish). Hope you enjoy this dish. 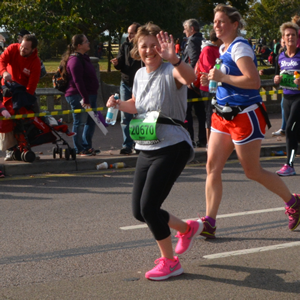 This time last year I was taking part in my first 10 mile run; the Great South Run That was one of the best challenges ever and I will never forget how I felt at completing that run. I couldn’t take part in this year’s race due to my foot injury but I would love to do it again. I first started running 5 year’s ago using the NHS Couch to 5k podcast. This is a 9 week programme that gradually builds you up to run 30 minutes. Since I had my foot pain in May, I have found it difficult to get back into a good running pattern. I made the decision to try the couch to 5k again. This time though I was going to have a running partner; Chris. I am a bit of a plodder when I run and because of this I do find running on my own is an advantage. Whilst Chris hadn’t run for a while, he was going to make me run and not plod! Can I cope? As someone who never believed they would never ever run, I am a big fan of the couch to 5k. I am now coming to the end of my third week and I am fully committed to my running plan. All runs start with a 5 minute walk and one of the other recommendations is to have at least one day’s rest in between each run. I have always stuck to this. Your narrator is a lovely encouraging Laura, who will tell you when to start, give you encouraging tips along the way and really is too nice to shout at when she tells you that you are half way through and don’t give up. Week 1 – run for 60 seconds and walk for 90 seconds for a total of 20 minutes. As this is my second time round, I found it so much easier. This was not the case the first time round. Running the first 60 seconds was so hard and then when I realised I had to do this 8 times, I was devastated. Normally maths is my strong point but first time I really could not make that add up to 20 minutes; more like 50 minutes. The one thing I recommend when you finish running is stretching. I missed this out on my very first run and my legs did ache. 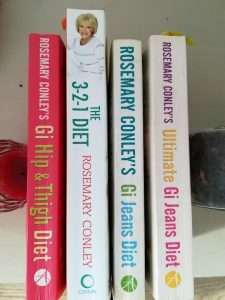 I use a stretching plan from Rosemary Conley 28 day inch loss book and I rarely ache now. 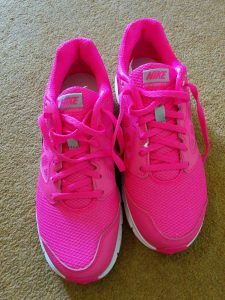 Week 2 – run for 90 seconds and walk for 2 minutes for a total of 20 minutes. This time you run 6 times. Week 3 – start with a 90 second run followed by a 90 second run. This is followed by a 3 minute run with a 3 minute walk. This is repeated again which makes your 20 minutes of exercise. I certainly would have whinged a bit about running 3 minutes the first time round but as Laura says, the feeling you get when you finish the session certainly outweighs the pain you feel. Honestly it does! So I will start week 4 next week. It is certainly helping me gently return to running. I am a morning runner but as I have been doing this programme with Chris, we have been running early evening. Normally I shy away from change but I haven’t noticed the change at all. So if you have always thought you could never run but are up for a challenge, give this a go. You won’t regret it and honestly it feels good to run for a bus! Thursday was the big weigh in. After following normal weighing procedures (and yes I did try it three times! ), I had lost 3 and a quarter pounds in 8 days. I don’t expect to see these results again but the first week of reducing calorie in take does result in a bigger loss. I have seen people lose a lot more than this but I was overjoyed with this. This result was due to the fact that I cut down on all that extra rubbish I had been eating; crisps, chocolate biscuits, chocolate and all the food that I put in my mouth when I am cooking! I am still eating normal dinners; curry with onion bhajis (a weakness this week), homemade pizza (I will share this later) and a toad in the hole made with my favourite vegetarian sausages. So, as I am doing this as part of a challenge on Rosemary Conley Online, I was so pleased to find myself 13th in the league table on Thursday. There is currently 164 people in the “lose a stone” category; they are so honest. They record their gains too! Making lunch last. I did find that if I didn’t have grapes at 11 a.m., I did want my lunch at 12.30. When I am at work, lunch is always the same; sandwich and a yogurt. I try to make this last over 90 minutes. That way I don’t feel overfull either. Letting Chris cook me breakfast most mornings. Okay I have to ignore the fact that he puts butter in to the scrambled egg. Yes there is a slimmers version of scrambled egg but it is so delicious and most of the time I walk 2 miles to work! This is more of a Tina’s tip – on the first week of a new eating plan, don’t also be too ambitious with your exercise. I always think that on the first week, eating less can take a bit of getting use to so if you are adding lots of exercise that you normally wouldn’t do, you can feel quite drained. Not telling work colleagues. I do the tea run at 11 so they don’t need to know I’m not eating the biscuits! It is amazing the opinions of others on this subject so I find it best not to talk about eating habits. Sticking with my normal meals. I have had what I actually want to eat including my favourite food ever, chips! I do have oven chips served with my own healthy turkey burgers. Wearing clothes that make me feel good. I did admit defeat a few weeks ago and bought some work trousers in a size 12. I found some cheap trousers in Asda’s George range which look good too. Treating myself. How many times do I say I need a treat and it will be a bar of chocolate or a cake. This week I had a shellac manicure and really love seeing my lovely nails. Surprisingly if I bought chocolate or biscuits regularly it would be the same price as having my nails done so if I can keep off them, my nails will be done regularly. Another treat; a food one. 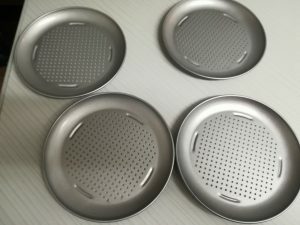 I bought four individual pizza trays from Marks and Spencer’s. Maybe not a treat in other people’s books but I was so excited to find them. We did have a lovely pizza using them. Dancing to George Michael’s Fantasy helped me this week. I have always liked this song and now it has had a bit of a Nile Rodgers touch, I certainly enjoy dancing around to it. Staying positive and not letting any problems encountered make me reach for chocolate and crisps. If I follow these again I am hoping that my next weigh in will be successful. It only takes a minute girl! Well I’ve been away from blogging for a while now. In fact, I have been avoiding a lot of things for a while. I’m not going to blame anything or anyone but myself for this negativity. 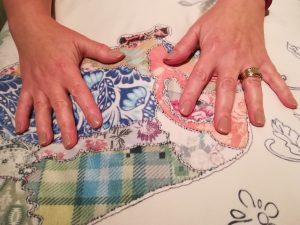 I haven’t been idle for all this time and whilst one of the activities I have chosen to do can be attributed for this post, I have also started a Christmas stitch a long and am actually managing to keep up with it. Last Tuesday evening, after finally accepting that I have a wardrobe of beautiful clothes that seem to have shrunk, I decided to visit Rosemary Conley online site. I have been a member for years and actually used the site to lose weight 5 years ago when I got down to my target weight. I had stayed within 7 lbs of this weight for quite a while. My love of cooking, which is an activity I have been doing a lot of recently along with my lack of exercise has contributed to a bit of excess flab around the waist. Do we need diets? Well, I don’t think we necessarily do if we accept the reason we weigh a bit more (or a lot) than we should is the result of overeating and/or lack of exercise. There are medical exceptions to this; something I can’t put my weight gain to unfortunately. I think diets do give you a purpose to lose weight and whether you go alone in reaching your goal, or find other people to go along the journey with, they are certainly worth trying. It is important to learn how to eat correctly and the importance of exercise whilst doing it. Which diet do you choose? I think you choose one that suits you. Personally, I do not like fad diets at all. All this do not eat after 7pm, this food group is not good for you or calorie counting is not what I’m all about. As for liquid diets; I would never go there. I still believe that is everyone’s choose though; just don’t try telling me I am wrong in my choice when you decide you are not going to eat bread! So why have I been a member of Rosemary Conley? I have found her books and exercise DVDs very useful. The DVDs could be described as low impact but if you haven’t exercised for a long time, they are perfect. I love the music in them too although sometimes Steps can get on my nerves. The recipes in her diet books are brilliant; so much flavour and for someone who likes to cook homemade food, perfect. For my weight loss 5 years ago, whilst keeping an eye on what I ate, I did the Lifestyle Plan which wasn’t a diet as such but made me think about what I ate and gave me guides to aim for each week. The first week, I learnt to put a number on my rumbling tummy. I soon learned that my rumbling tummy did not mean I was hungry at 10 a.m. so my lunch could wait until lunchtime. Just following it meant I chose wisely when going out for a meal at a restaurant the day before my birthday, ate fish and chips on Brighton pier in the rain for my birthday and had a slice of homemade birthday cake. I still managed to lose 2lbs that week! On this plan, I gave up on a guilty pleasure, eating Pringles. Pringles were only something I bought at Christmas but once they were open, I had to eat them. I have been Pringles free for 5 years. Since then, I have given up on chocolates in tins; roses, quality street,celebrations. I would eat them without tasting and enjoying. This worked for me although it might not work for everyone. I really needed to get back in to control. I just went to look at the diet plans and ended up signing up for their winter challenge; lose a stone in 8 weeks. I needed now to make the brave mood to weigh myself. 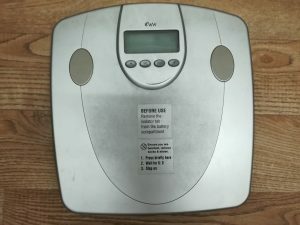 Wednesday morning, I woke to start the routine of weigh in. I am very particular on this routine. It has to be done first thing in the morning before any liquids or food passes through my lips. First of all, I like to be in the lightest clothes as possible; pyjamas are perfect for this. A visit to the bathroom is then necessary then I make my way to the kitchen. I weigh myself in this room because the floor is more level. I knew the result is not going to be good and I do the best of three. They are all the same; I have to lose a stone. Now I know, I feel a bit more motivated to try to lose it. I can do this one step at a time. First step is to give up eating in between and to stop picking at food whilst eating. A week later I have been okay with this. I have made Thursdays my weigh day so I will let you know if I have lost anything soon! Hopefully it will be a lighter me writing the next post. What’s in the Box, the Cardboard Box? My favourite time of the month is when I get my e-mail to say that my next baking box is on its way and what ingredients I need. This month’s e-mail came through on Friday 14 July. I needed to buy medium eggs, unsalted butter and double cream. I added the eggs and butter to my shopping order but decided against the cream. I could buy that when I decided to do the bake. I didn’t have a clue what it would be. Most bakes need eggs and butter. Double cream didn’t help at all. My box was delivered on the following Monday when I was in Cardiff for Kathryn’s graduation. 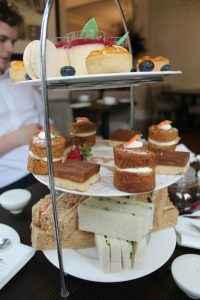 After having a fantastic afternoon tea, I couldn’t even think about baking cakes. It really was a lovely tea, mini carrot cakes (I am going to find a recipe), apricot frangipani tarts (must make these too), milllionaire shortbread, macaroons, scones and welsh cakes (not to forget the sandwiches and lemon posset with raspberry coulis), I couldn’t think of eating anything for a couple of hours. I did open the box as soon as I got home, and maybe it was because I was still full by the lovely tea, but I didn’t get so excited by what I saw. 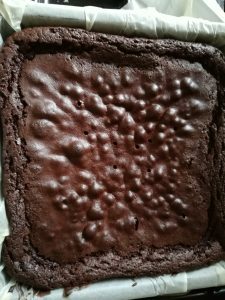 I think the reason I wasn’t so keen was because I have found the perfect brownie recipe. It is a Mary Berry recipe which I bake in my traybake tin; an all in one method with lots of cocoa powder and chocolate chips added. 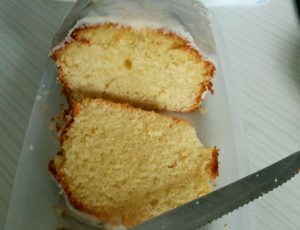 The cake has just the right amount of squidginess about it and is lovely served warm. 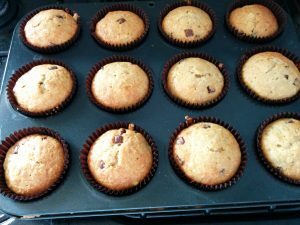 When you find the right recipe, why change it? 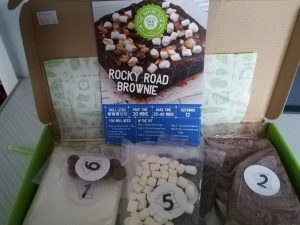 As for rocky road: never appealed to me at all. That said, I think the recipe is still brilliant and I think it comes at the right time. I belong to the Facebook group and a lot of the people there bake the boxes with their children. With summer holidays here, this is so ideal. As I had both Jordan and Kathryn home at the weekend (my grown up children), I thought I would get this bake made. I decided to bake on Saturday and started early. The bake needed an 8 inch (20cm) tin. I had one of these. 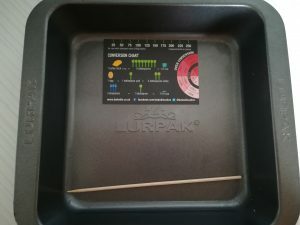 It is actually a freebie I got when buying lurpak butter a few years back. I got a great loaf tin on one of these offers too so they are really worth looking for. Oven on, tin prepared and I just had to measure out the butter. 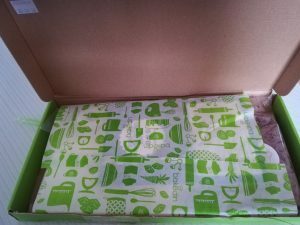 As well as the bagged ingredients, greaseproof paper and recipe, the boxes always include a butter measure and a skewer. Even though butter comes with a measure along the side, I still get out my trusty scales out to weigh and have never used the butter measure. I thought I would this time. I still had the scales and I don’t know why I should have been surprised to find that the measure was correct! This process was very easy. I just needed to cream the soft butter together with the caster sugar. I opted for my wooden spoon and used a bit of muscle here. 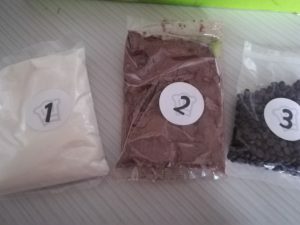 Next was to add bag 2 and 3 plus three eggs and mix until combined. As the recipe said pour the mixture into the tin I needed to get a good dropping consistency. My normal recipe is an all in one method so I normal use my food processor. 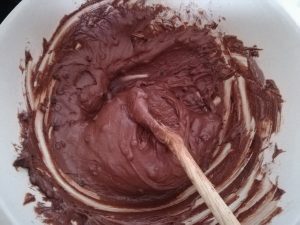 I have got an electric hand whisk and think if I were to make this again, I would use this to get a quicker result. Recipe said that it would take 35 – 45 mins to bake and that the skewer should come out nearly clean as they should be gooey inside. I was satisfied with the cook after 50 minutes so I set about making the topping. First of all, I had to make a caramel sauce. This is something that I had done before when making eclairs and I had been quite successful. I had to heat the sugar on a low heat, stirring continuously until the sugar is smooth and light brown. Next step is to move from the heat and add double cream and unsalted butter. The sugar did not cook as smoothly as the last time as making them but I did carry on and managed to save enough caramel to pour over the cake. The pan did take a bit of scrubbing! 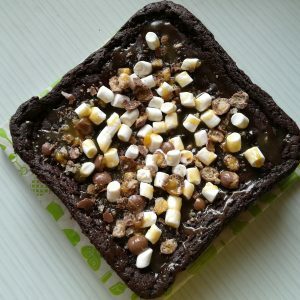 Last steps were sprinkling with marshmallows and bashing up the malt balls before sprinkling on top too. Very pleased with the result and 11.30 a.m. on a Saturday morning found myself and Jordan tucking into a slice. Well it was the weekend! Can’t wait to find out what’s in the next box. Ain’t Giving Up, I’m Going to Tell the World, Got to Make it Show! Reaching my 50th birthday and having my 50 challenges was a brilliant goal to have. I have to say that since completing, I feel I have lost my way a bit. As I said in my last post of the challenge, I thought it would be a great to set myself a challenge for each year. I am still very keen with my cooking and am enjoying finding new recipes. Haven’t quite managed to do one a week but hopefully will catch up. I did finish the year with a foot injury which set me back in my exercising. I first had a pain in my foot after a run on 29th April. It was a day when I was doing one of my challenges; bake a cake you haven’t baked before. This meant I was standing on my feet a lot so I didn’t rest it. The next couple of days I did and thought I did enough but unfortunately it wasn’t. I carried on walking and did take part on my 10k run. I finally gave in after my holiday, started driving to work, didn’t got to Zumba and my Fitbit challenges suffered. I did find that the more I rested, the tougher it was to get going. After three weeks the foot did start feeling better so I slowly started building up and managed a Zumba class. Surprisingly, I did find the more I exercised, the foot did feel better. There were, or should have been some advantages. I had more time as I was driving to work so I was getting home earlier giving me time to do more work. Didn’t always happen! I did start doing Aquafit as it wasn’t so tough on my foot. I am now looking at a swimming membership at my local pool. Amazing as I am not keen on swimming at all. Probably a lot more disadvantages though. My fitness levels dropped; my appetite didn’t. Jeans do not fit. Motivation is at an all time low. Time to change all this NOW. This was set to spur me on with helping me eating healthy. We have a local shop which is too close. It means we can just nip over and buy naughty food. Unfortunately have replaced chocolate with chocolate biscuits which defeats the object and they do have very nice Belgian buns. I am hoping that I will continue with this challenge though, ditch the chocolate biscuits as tea really does taste better without them and perhaps learn to have crisps as a once a week treat. I have not missed them but I do love crisps. I am slowly getting back into regular exercise so I need to start my morning routine. Jeans must fit me by September. I’m not quite ready to run again; this is a September goal but not a challenge. On my 50th birthday, I was very proud of having a flat stomach. Age is blamed on a lot of elements and I will not succumb to the fact that my stomach is not flat due to my age. The simple fact is I have eaten far too much. A lady that would certainly tell me this is the American personal trainer, Jillian Michaels so I am planning on doing her 30 day shred. She will be telling me if I want a stomach like her girls, I will have to work for it and to imagine going jean shopping. I AM going to look good in my bikini again! I am planning on getting up early again, starting this on the 31 July and having a rest day on Sundays. I will do a very long walk as an alternative. Getting ready to be shredded! Although I don’t drink a lot, I am going to not drink at all in September. I will hopefully find a non alcoholic drink that I can enjoy all the time. If I manage to get Chris to join me on this one, I will donate £5 each week to my cash for kids page. On holiday last year (on my 50th birthday holiday), I purchased a book called 30 days to have a clean and organised house. I think October will be the best time to read this and put it into action. I have neglected my resolution to declutter every Saturday but am planning to start this again. I so love decluttering! This might be a tough one. I wrote my short story for my challenges and loved it. 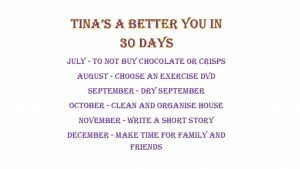 I got my motivation for writing a story by reading A Better You in 30 Days. The author made me believe I could do anything I wanted. As someone who reads a lot and dreams a lot, I had many ideas for writing a story. On a walk or a run, my mind is constantly buzzing. I like surprises in the books I read but still having the clues there. There are a few books I would love to read again so I can pick up the clues with me knowing the ending. Hopefully I will be able to succeed in writing something along those lines. I hate it when people say they haven’t seen me because they haven’t had the time. To me that is absolutely rubbish. What they really mean is they didn’t want to see me. I really try my best to avoid saying those words although I don’t actually tell people that I don’t won’t to see them. Give me a few years and I won’t care; I will tell them! My plan for December is to make sure I find that extra time to phone a friend, visit a relative or invite someone round for coffee. Hopefully it will carry on throughout the next year. After all, family and friends aren’t just for Christmas. Making these plans will hopefully get my mojo back, get me back into the jeans and make me a better person. Most of my meals have always consisted of some sort of meat. Breakfasts are sometimes a healthy cook up, lunch for ease will probably be a ham sandwich and there is always some sort of meat/poultry for my dinner. As a child I was never forced to eat vegetables and I was never so keen. All that green on my plate did not appeal to me. Pregnancy made me realise that I should eat more plus when I actually cooked my own,vegetables were cooked with a little more bite. Whilst I would still prefer meat to veg, I am certainly trying a lot more. I have therefore decided to make Mondays, meat free Mondays. The last four weeks I have been having boiled eggs or porridge for breakfast, a cheese sandwich for lunch and then having meat free dinners. Looking through my books, it is amazing how most of the books main courses all have fish or meat in and the vegetable section is mainly accompaniments. All of the recipes I have made are from my Rosemary Conley books. We have had a spinach and ricotta cannelloni and a pizza which I was a bit heavy handed with the passata. 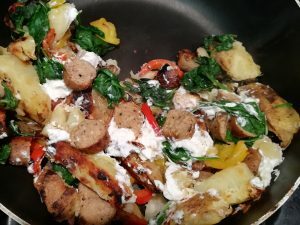 This week I bought Cauldron Lincolnshire sausages, added peppers, new potatoes, spinach and goats cheese (my new favourite) and within no time I had cooked a very tasty dinner. These sausages will replace my normal pork sausages. If you ask me what is my favourite food, I will have so much trouble answering and it does change year by year. Among my favourites are lasagne, bolognese, toad in the hole, stew (chicken with dumplings is a big favourite at the moment and so quick) and of course, roasts. I also have a thing about macaroni cheese. It was a dish that I made a lot when the children were small; tinned was never served in my house. Now macaroni cheese sounds like it’s vegetarian but no it wasn’t. The first one I made had bacon and mushrooms in and was delicious. The family macaroni cheese had cooked turkey in and was topped with breadcrumbs. A very filling meal. 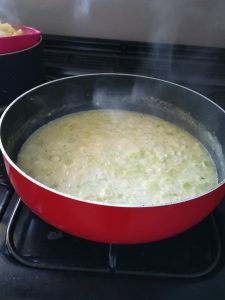 My cheese sauce was always made with butter and I used the traditional method; melting the butter, adding the flour to form a smooth glossy paste then adding milk gradually stirring all the time. This sauce was a favourite to make as a cauliflower cheese for roasts too. As I became more health conscience, I did find an all in method without butter and the use of cornflour. It took trying a few different recipes before I found the perfect one to make the consistency I wanted. 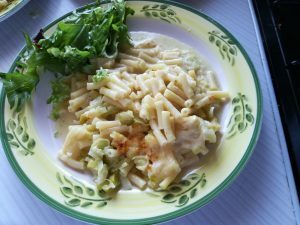 I decided to try a new recipe from Rosemary Conley’s Ultimate Gi Jeans Diet, cider and leek macaroni cheese. I have to say that at first the idea of cider in my macaroni cheese did not appeal to me. With the exception of baby leeks and cider, everything else needed for the recipe where my normal “store cupboard” ingredients. The recipe actually said that preparation time was 10 minutes; with only baby leeks to finely chop, garlic to crush and cheese to grate, I actually did it in this time. Preparation in any dishes really should be done before starting any cooking; I can sometimes fail here particularly if I am trying to hurry a dish. I am trying hard to get better at this. This sort of dish requires everything to be ready as it is one of those meals that need to be served straightaway. I started cooking the macaroni then started frying the leeks and garlic. Now here I think I chose the wrong cooking pan; my lovely red frying pan (well a saute pan but it is my favourite pan ever). It was perfect for frying the vegetables but I then had to make the sauce in the pan and I think it was the wrong size. The actual smell coming from the kitchen was delicious but the sauce didn’t thicken the way I would have liked it to. When assembling it together, I didn’t really feel it looked like a macaroni cheese so I was a bit disappointed serving it up. Chris and Kathryn were very generous with their praise and it did taste very nice. I will cook again and try harder with the sauce. With some cider left over, I was keen to try another dish with it in. 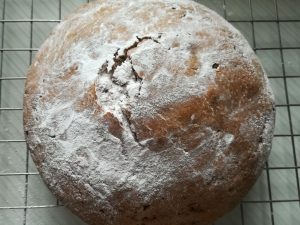 I found a cider cake recipe from Paul Hollywood’s British Baking book and thought I would give it ago. I did look at the ingredients and feel that it sounded a bit bland. I also think that by the time I did bake it, the cider did go a little flat. 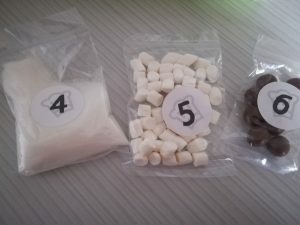 I was intrigued with the science of the ingredients; the raising agent used was bicarbonate of soda and Paul explains that you need an acidic ingredient to activate it. In this case the cider does the job perfectly. My cake did turn out like the picture but it won’t be one that I will make again although I think if I had served it with hot custard, it would have been delicious. As Macaroni cheese is one of my favourites, I think I will try a few more recipes out to find my perfect dish.